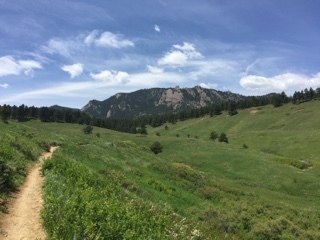 One of my goals as a runner is to escape the suburban streets when possible and run on the trails of Colorado. The scenery is better, the paths are more forgiving, and the elevation changes are much more drastic. For my first trail run of the year, I decided to link up Doudy Draw and the Spring Brook Trail loop. It's a 5-mile course near Eldorado Canyon that's popular with hikers, mountain bikers, and even horseback riders. It only nets about 580 ft of vertical gain (most of which comes in the first two miles), but it's still a lot more challenging than anything I find in Broomfield. In the past, when I've gone trail running, I've simply thrown on an old pair of street running shoes and hit the dirt. However, this always lead to me slipping on loose dirt and rocks every time I tried to move laterally. The last thing I want is to lose my footing while I'm bombing down a trail, so I decided I'd better get some appropriate off-road shoes. I used an REI gift card and nabbed a pair of Salomon Speedcross 3 shoes that looked like their tread could rip your face off. But when I got on the trail with them they performed beautifully. They're lightweight, responsive, and they grip the trail nice and tight. I'm stoked to take them out again on some trickier terrain to see how they perform. Overall, the run went pretty well! I completed the loop in just a little over 47 minutes and felt strong the whole way. This is definitely one I'll be revisiting! The scenery is a lovely combination of grassy open meadows and ponderosa pine stands. Routes like this remind me why it's so much more enjoyable to get out and run in nature as opposed to on pavement. I can't wait to do it again!